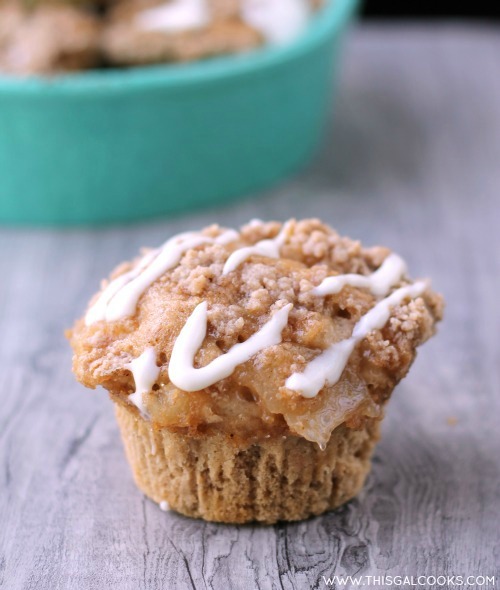 These Apple Spice Muffins are the perfect way to start your day! Spice cake mix, apple pie filling and streusel topping bring you one delicious muffin! I don’t know about you but I love muffins. I love baking them. I love eating them. I love going into bakeries and cafes and looking at the muffins in their display windows. They always look so perfect and delicious. Baking muffins is beginning to be a favorite activity of mine. There are so many different ways that muffins can be prepared; the possibilities are pretty much endless. Yesterday I made some Vegan Apple Berry Bran Muffins. Not only are they delicious, they are also pretty healthy. The Apple Spice Muffins that I’m sharing with you today aren’t exactly what I’d call healthy but they are delicious. And sometimes delicious food triumphs healthy food. And that’s ok as long as it is in moderation. Doesn’t that ooey gooey apple pie filling look delicious? Apple pie filling, streusel topping and a drizzle of cream cheese glaze. 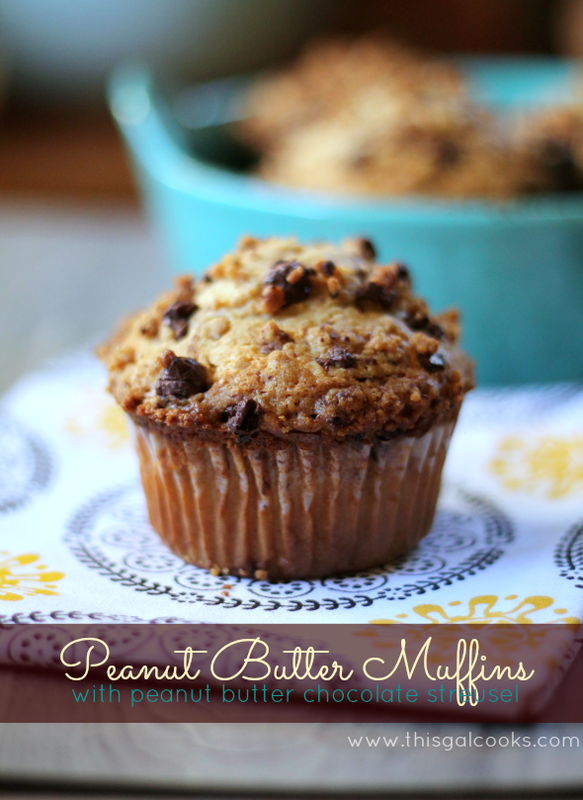 You can’t go wrong with these delicious little muffins. Go ahead, you know you want to make these. Don’t worry, they are super duper easy to make. 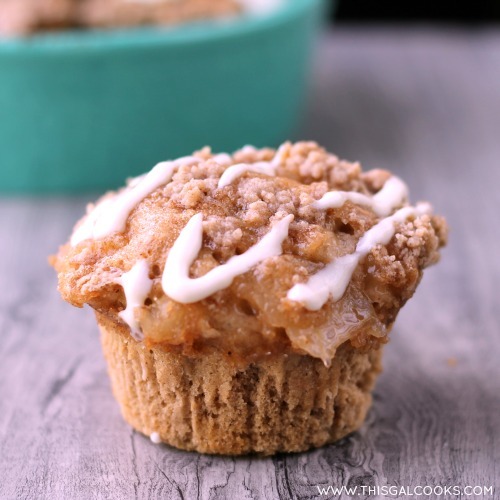 And if you recently made my Blueberry Coffee Cake Muffins, then you just might have some cream cheese glaze leftover, which eliminates the need to make it! 1 21oz can apple pie filling. You'll probably need to chop the apples. In the bowl fo a stand up mixer, beat together ½ cake mix, water, flour and baking powder. Drop batter (about 2 tbsp but more if you want bigger muffins) into lined muffin cups. Then drop some of the apple pie filling onto the top of the batter. In another mixing bowl, cut the butter into the remaining cake mix until it's crumbly. Top the apple pie filling with the some of the crumb mixture. Do this to each muffin. You don't want to leave anybody out, do you? Meanwhile, make the cream cheese glaze. In a mixing bowl, beat together the cream cheese and powdered sugar. Beat in the vanilla extract, whipping cream and gradually beat in the milk until the desired consistency is reached. Allow the muffins to cool for 15-20 minutes and then drizzle with the cream cheese glaze. 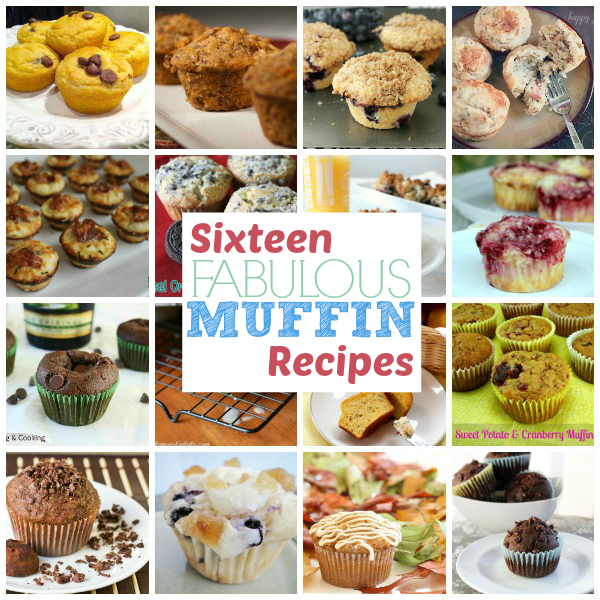 Craving more muffin recipes? Here ya go. You had me at ooey gooey pie filling! And yes, it looks amazing Julie! An apple pie for breakfast? Yes please! These look so delicious and amazing!! I want one. These look sooooo delicious! I’m a sucker for muffins too, I could eat them everyday for breakfast if I made them! Thank you, Nancy! I could too! I totally agree Julie! You can prepare it in so many ways. 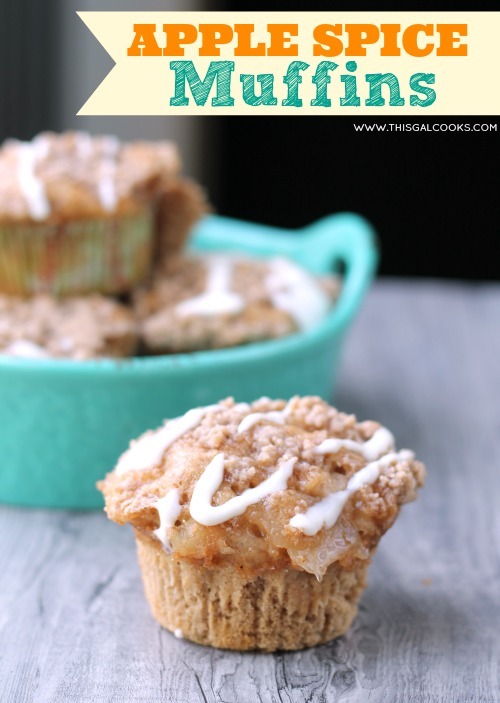 I LOVE muffins and these apple spice muffins sounds so good right now with some coffee of mine. :) Have a great week! Thank you, Anne! I think I want to make some savory muffins soon! Have a great weekend! Haha, yes I am! Thank you so much for stopping by, Claire! Julie, these muffins look and sound totally yummy! Pinning! Thank you., Loretta! That’s how I am. Too much glaze is just too much! Thanks for stopping by! There’s nothing I love more than muffins! I’ll be pinning all those recipes. Thank you! These look delicious, Julie. Great idea to use cake mix! I love apple spice flavored food, there is just something about the soft apples with sugar, cinnamon, and nutmeg that I love. This recipe looks super easy, definitely gonna try it! Thanks Julie. Thank you for stopping by, Krista! Another one of my favorite apple recipes is an Apple Betty. OMG. Baked apples with a crunchy cinnamon/sugar/butter topping? YES PLEASE! Have a good weekend, Krista! Ok! UM… Yes please is right! With a vanilla bean ice cream melting on top. Now I’m hungry! I love to bake muffins. You’re right, there are so many variations out there. :) I’ve not tried an apple spice one yet and these look delish. Definitely want to make these. These look so tasty. I love apple and spice. These look so moist and full of fresh fruit flavor! Can’t wait to try them! 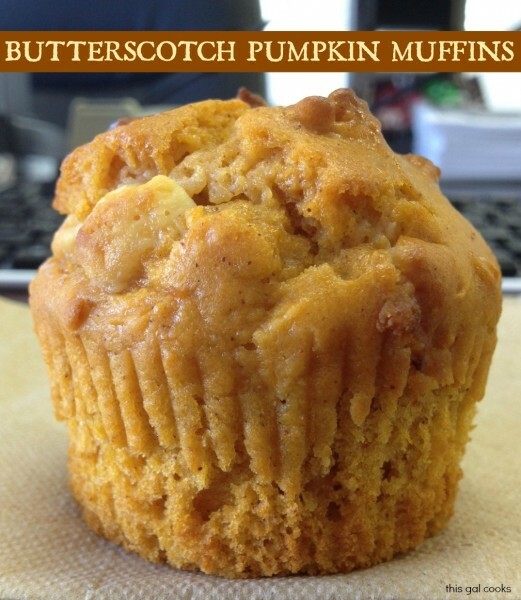 I just love a good muffin and these look so moist and tender! Beautiful! We are not too big on apples in this household, but these look and sound too wonderful to not at least try out a batch!! The picture looks great and it makes you want to bake these. However, this recipe did not work for me! I could only get 8 good size muffins out of the recipe and I had lot of apple pie filling left over, as well as the streusel mix. I did follow the recipe perfectly, even measuring out the half of the cake mix on a scale. The bottom part of the muffin came out dry. I am disappointed but glad I tried it – now I know it won’t be a keeper, unfortunately. I’m so sorry the recipe didn’t work for you. I appreciate your feedback.